Lake Waco Golf Club is a semi-private facility that is open to the public with a limited amount of memberships available. Annual Lake Waco Golf Club members are invited to play at Twin Rivers Golf Club for a 20% discount Monday through Thursday. Twin Rivers Golf Club annual members are invited to do the same. Join us for our weekly scramble. Call us to schedule your next tournament or tee time. Lake Waco Golf Club is nestled among the Oak Trees, on the north side of Lake Waco, featuring a full 18 Hole Regulation Golf Course and the only Executive 18 Hole Par 3 Golf Course between Dallas and Austin, built on one of the prettiest golf venues in Central Texas. Whether a club member or a public patron, beginning or experienced golfers can enjoy a quick round on the Executive Par 3 Course or move up to the more challenging 18 Hole Regulation Course. Club Members can fish the many lakes located on our facility and will be able to enjoy many hours of family fun while they lounge around our large pool this summer (Opens Memorial Day Weekend). Our restaurant "Legends Grill" is open to the public and serves outstanding food and beverages with a fully stocked bar. 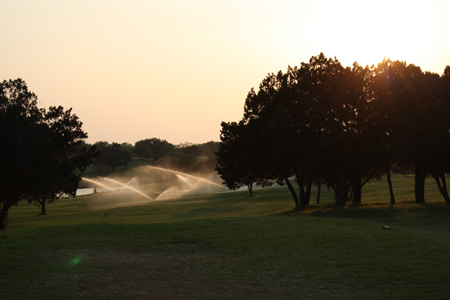 Being a Private/Public facility, Lake Waco Golf Club welcomes any person wishing to play our course. For information concerning Tee Times, Course Playing Conditions, Club Memberships or Tournaments please contact us at (254)-756-2161. Want to throw a legendary holiday party this year? How about booking your Christmas or New Years party at the Legends Grill located at the beautiful Lake Waco Golf Club? There are several party options available that can be arranged to suit your event. Lake Waco has slacks in stock! Black, grey, and khaki Adidas slacks are on sale in the pro shop. So come on out and get your slacks for the cooler months. Also, Taylormade throw back hats and vintage t-shirts! We always have great pricing on everything in stock. Please ask our staff for the current sales and deals that are offered.